Depending on who you asked a couple of months ago, 59 kilograms at the 2017 Greco-Roman World Championships was either going to be a one-man show or, too incredibly deep to even bother coming up with a lockdown favorite. The athlete deemed to be at the top of the class, returning Olympic champ Ismael Borrero Molina (CUB, world no. 1), unveiled his own version of Mozart’s “Requiem” last year in Brazil. With all of the steam surrounding his win in Las Vegas, Borrero Molina went out there as cold as ice in the biggest event of his life thus far and systematically took apart several of the best wrestlers in the world, including Shinobu Ota (JPN) in the finals, who was one of the Cuban’s two tech fall victims on the day. And he won’t even be in Paris. Then again, neither will Ota. All of this has made 59 kilos appear to be somewhat of a free-for-all. With no clear favorite and a handful of experienced, hard-charging candidates taking over, expect this weight class to develop slowly. A “name” wrestler will likely knock off another, getting everyone all excited how he might be on a run towards a medal until of course, he’s knocked off himself. The lack of a no-doubt favorite actually makes 59 more suspenseful. For years and years, we’ve had six-time World Champion Hamid Soryan and others like Rovshan Bayramov, Ivo Angelov, and so forth to anchor the sport’s lowest weight class, but now we’re starting to see some hints of turnover and that’s refreshing. With Borrero and Ota no longer in the mix, Berge is now the #1 seed. At 34 years of age, the old dog still has some fight in him. Berge took a break from competition following the Olympics and returned in full at the Tbilisi Grand Prix in June where he lost a good finals match to Mirembek Ainagulov (KAZ), who is also on this list. In Georgia, it was easy to tell the par terre-less rule-set agreed with him, as Berge was able to grind and grind and grind to his heart’s content. He had always been a tough customer in both phases of par terre, but for a guy who likes to work tirelessly in the ties, the updated rules give him more chances to break opponents down in effort to score deciding points late. That reason and that reason alone keeps him as a worthy medal candidate in Paris. Maryanyan is making his second appearance at the Senior World Championships after finishing 13th in 2015, and he is partially here due to his narrow defeat over 2012 Olympic bronze medalist Mingiyan Semenov at the Russian Nationals in June. He’s a stout competitor who can be ultra-aggressive in spurts, but he also doesn’t seem to quite pour it on like you figure he could. That isn’t to say he isn’t rugged. Maryanyan bangs heads with the best of them and will try to use his physicality to crack open more defensively-minded opposition, especially if he senses a clearing. He’s also as technically-sound as they come when it’s time to throw. Maryanyan is a lover of the straight lift and can force it from a variety of transitions. Definitely one of the marquee names to look out for. Fumita’s trek to Japan’s top spot began with a win at the Golden Grand Prix. 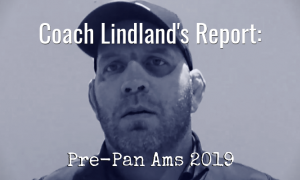 He defeated Ota in December, but dropped a match to the Olympic silver medalist at the Cerro Pelado International in February. Fumita stayed busy and effective, garnering titles at the Hungarian Grand Prix and the Asian Championships back-to-back before dropping another bout to Ota in the Pytlasinski Cup last month. He rebounded with another tournament win, this time at the Grand Prix of Spain. While there may be some more grizzled competitors here, no one is hotter than Fumita and at this stage, it would be an upset not to see him standing up there with a medal around his neck. Pound-for-pound, Yun might be the most exciting wrestler in the entire tournament. He’s very rarely static. If the whistle has blown and time is on, Yun is constantly prowling for scoring chances. You could get out of breath just watching him. There are many matches like that on his resume, and then there are some where he can fall victim to hesitation, putting him out of his element. But he is another who without the burden of the action being stopped for par terre, will be a must-watch. However — that could also hurt him. Yun hasn’t competed under the revised rules yet and though extremely aggressive, he benefitted greatly from par terre chances. Assuming he’s fresh and on his game, Yun is still someone to pay close attention to. A veteran who has missed out on some opportunities because one of the elite guys in the sport hovered over (Bayramov), Mammadov checks in as an interesting underdog story. Azerbaijan tabbed him for a few World Cups, including the most recent edition in March, but this is his first World Championships event. That being said, he has been around and then some. 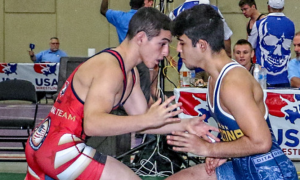 Mammadov has locked horns with most the top competitors at this weight class with varying success. As an athlete, this guy is a power puncher. You won’t detect a ton of nuance in Mammadov’s game. He’s after the body and likes to get as close as he can in the tie-ups so he wrap around for lifts. There are times when he can come loose off of exchanges, which completely disrupts his aggro rhythms. But the brutal inside work he prefers makes him one of the least palatable early-round entries for everyone else in this bracket. Ainagulov is a fun watch because he is loose, athletic, and likes to open up. US fans should know about this guy. 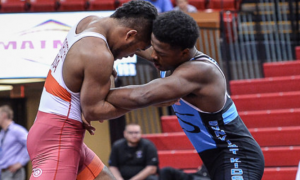 Ainagulov defeated WCAP star Ryan Mango at the Schultz some years back and RaVaughn Perkins (71 kg, NYAC) tech’ed him out badly at the 1st OG Qualifier in April of 2016. 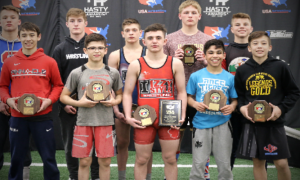 Outside of his limited history with a couple of Americans, Ainagulov is actually one of the most complete lightweight Greco-Roman wrestlers on the planet. He likes to angle in the tie-ups, darting in and out using decent pressure so that he can fire in on any perceived windows of opportunity. Ainagulov is also, as you might suspect, a very capable thrower, though he tends to be more classical, preferring straight lifts and the occasional arching bodylock. But his headlock is fine, too. Fumita was more than a step ahead of him in the Asian Championships finals and there are a couple of others here who will also give him problems. That being said, Ainagulov is a solid contender who could certainly have a say in how all of this goes down. After fashioning a more-than-respectable career while representing his native Uzbekistan, Ildar Hafizov won a lottery trip to America and soon after became a member of the Army’s World Class Athletes Program. Immediately upon his arrival he became a very legitimate candidate to win the Olympic Trials. 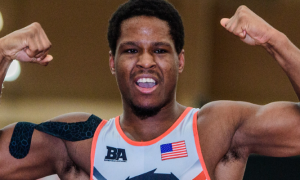 But before that happened, he won a National title when WCAP teammate and multiple-time World Team member Spenser Mango defaulted out of the finals. 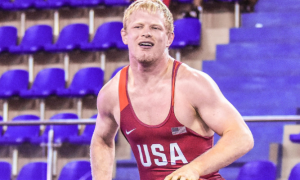 That was supposed to be the collision course at Iowa City’s Trials, Hafizov and Mango, but as everyone knows, Jesse Thielke (NYAC) went out and defeated both wrestlers back-to-back to (eventually) nail down his spot in Rio. A knee injury sidelined Hafizov until this winter and he came back looking sharper than ever. To start, he blitzed all three opponents at the US Armed Forces Championships. Then a week later in Denmark, Hafizov sliced through the competition at the Thor Masters Invitational to earn his first tournament win as an American. Things didn’t go quite as well the next week im Croatia, as a first round loss to Ivan Lizatovic (CRO) ended his day early. 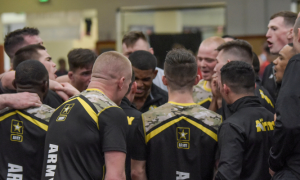 That gave Hafizov plenty of time to hone in on making his first US World Team, which he did in late-April by defeating Hayden Tuma (Army/WCAP) in two straight matches. His last time out was the Tbilisi Grand Prix. A clean, controlling win over Khvicha Tchitava (GEO) opened up the day, but Hafizov was then turned back by Stig-Andre Berge in his next bout 2-1. A subsequent one-sided repechage loss to Lasha Mariamidze (GEO) moved him out of medal contention altogether at the extraordinarily tough tournament. For Hafizov to be successful at the Worlds, it is going to be about more than just the draw (which is doubtfully going to be favorable). He’ll want to turn it on early. If we’ve seen anything from the way international wrestling is currently being governed, it is that fast-starters benefit more than the patient types. So he’s going to need to get on his horse right away. Hafizov won in Denmark because he forced the issue repeatedly. He used his two-on-one to navigate the tie-ups and opportunistically attacked the body. He was also able to capitalize on takedowns and turn them into further points via gutwrenches and straddle lifts. Keeping his legs moving and pouncing on every available opening against these speedy ninjas are Hafizov’s keys to victory. There is no one here who is beyond his scope and he’s already shown he can press one of the best guys at this weight. One period at a time, one win at a time. There aren’t a lot of folks expecting a whole ton out of Hafizov probably, but that means nothing. Out of the eight guys on this squad, he holds the most pronounced international resume along with the kind of veteran’s understanding that can make a difference. Absolutely, Hafizov is capable of doing something here. Seung-Hak Kim — KOR — Kim hasn’t competed since the summer of ’16 when he went up to 66 for the Pytlasinski. Has a good motor and assuming he’s in shape, will be a dogfight waiting to happen for somebody. Kristijan Fris — SRB, world no. 4 — The well-traveled Fris earned a bronze medal at the World Championships a decade ago and has remained a tough competitor. Surprised with a win at the Euros in May, defeating Angelov in the finals. Ivan Lizatovic — CRO, world no. 7 — Lizatovic is another seasoned vet who is always a difficult to deal with, primarily because he can be positively brutal in the tie-ups. He’s not deemed to be a serious medal contender, though he could be.